A casual day of birding turned into a chase for Sandhill Cranes that were spotted in Sagaponack Long Island. 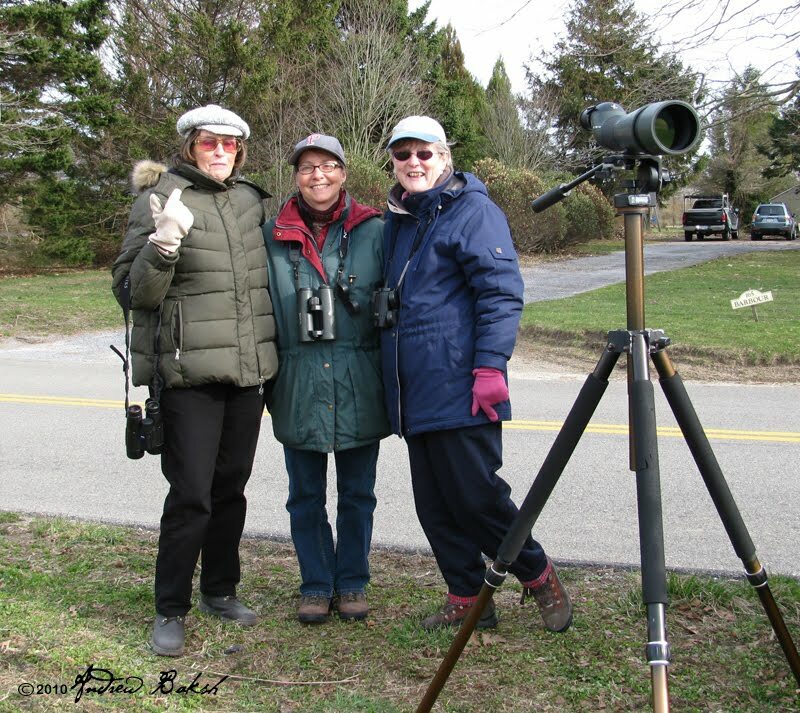 My Saturday, began with some early morning birding with my friends, Shai Mitra and Patricia Lindsay. 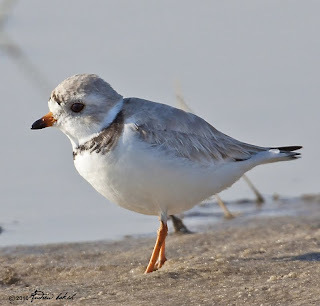 We parted ways around 8:30 a.m. as I had designs on birding Fort Tilden in Queens and they were heading to another location on Long Island to bird. 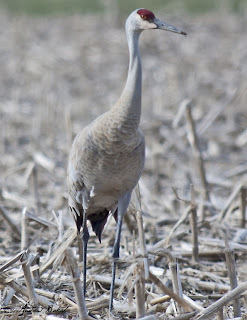 Hours later after a series of calls I was heading out to Eastern LI to chase the Cranes. I made one stop to pick up Joan Quinlan (sp) who you might remember was with Shai, Pat and I when we made the trip to the Adirondacks and knocked off three specialties, Tufted Duck, Ivory Gull and Northern Hawk Owl, all in a matter of hours. 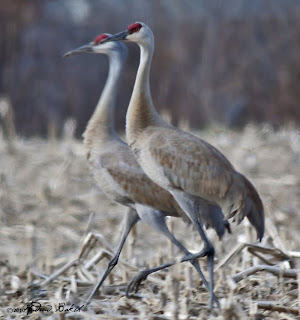 I was hoping to repeat our streak with the Sandhill Cranes. 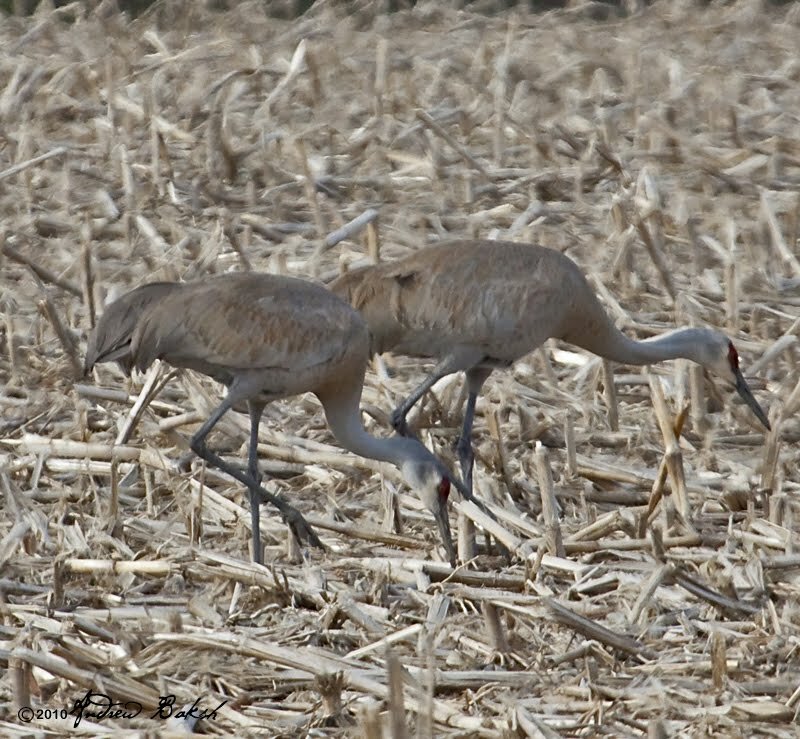 Joan and I made quick time and arrived at the location where the Cranes were seen earlier, but they were not there. Patricia Lindsay and Gerta arrived moments later to aid in the search. Scoping out the birds on and around the Sagapond flats turned up 2 adult Lesser Black-backed Gulls and 2 Tundra Swans, but no Cranes. 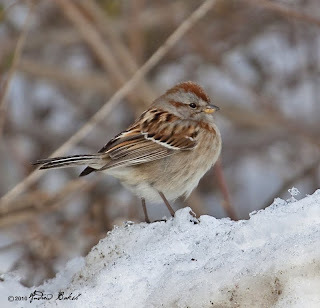 Staying positive, we followed Pat to get Shai who was on another mission, in search of a Western Field Sparrow that was seen, but only briefly. 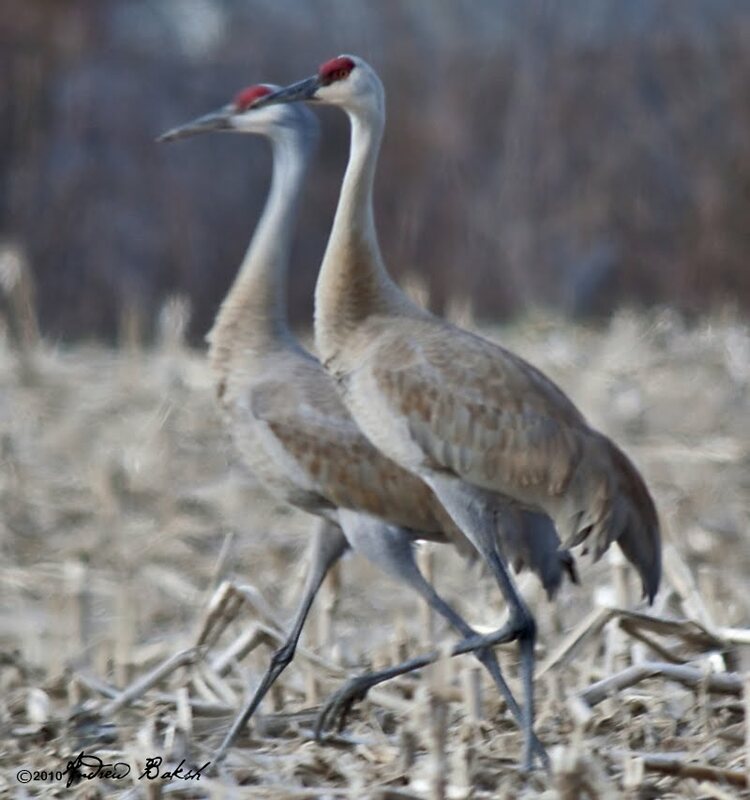 Along the way for Shai, we were checking the fields and it was a corn field on Daniels Lane that we spotted the Sandhill Cranes, picked out first by Patricia Lindsay. They were all the way in the back of the field blending well into the background. We had relocated the birds and so the word went out that the birds were once again found. 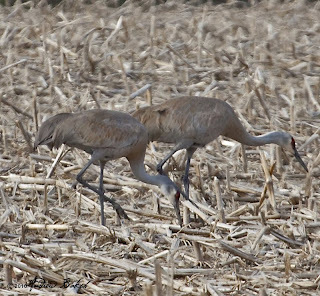 Pat and Gerta went off to get Shai while Joan and I settled in to watch the Cranes. 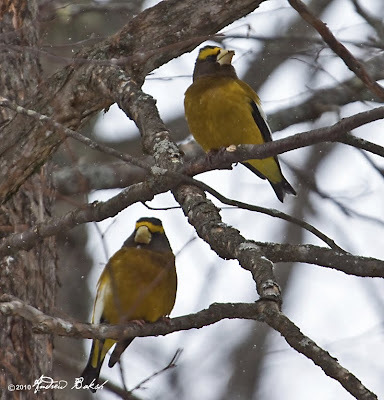 I digiscoped and photographed the birds enjoying the looks, which was much better than the one I got on the NYSOA trip. 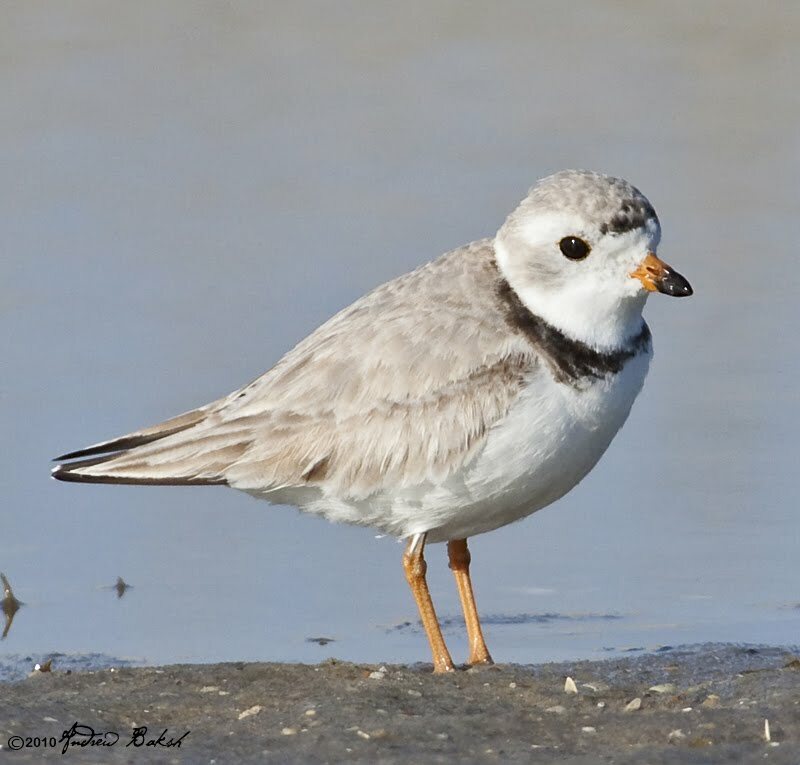 If I got this right, according to the New York State Ornithology Association database. Since 1978, there have been 5 reports submitted of Sandhill Cranes (Grus canadensis) sightings on LI, 3 of which were accepted. This would make number 6, which will no doubt be accepted given the many observers and photograph documentation. 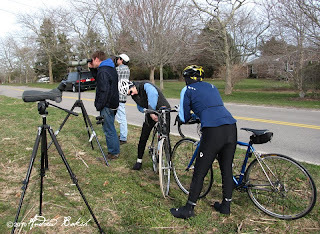 A few locals were interested in what we were looking at. 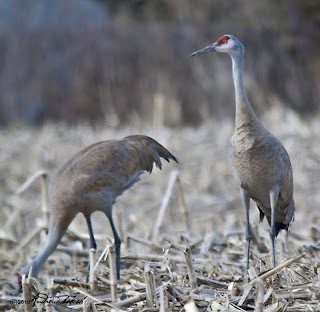 Sandhill Cranes at Sagaponack Long Island NY. Satisfied birders...and yes, the cyclists got in on the show. 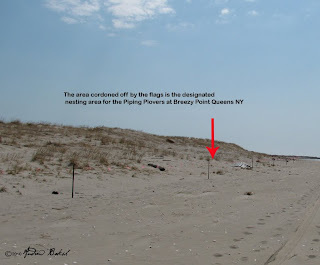 On Sunday, 15 volunteers joined Bio technician and Plover Project leader, Tony Luscombe, of the National Park Service at Breezy Point in Queens NY. 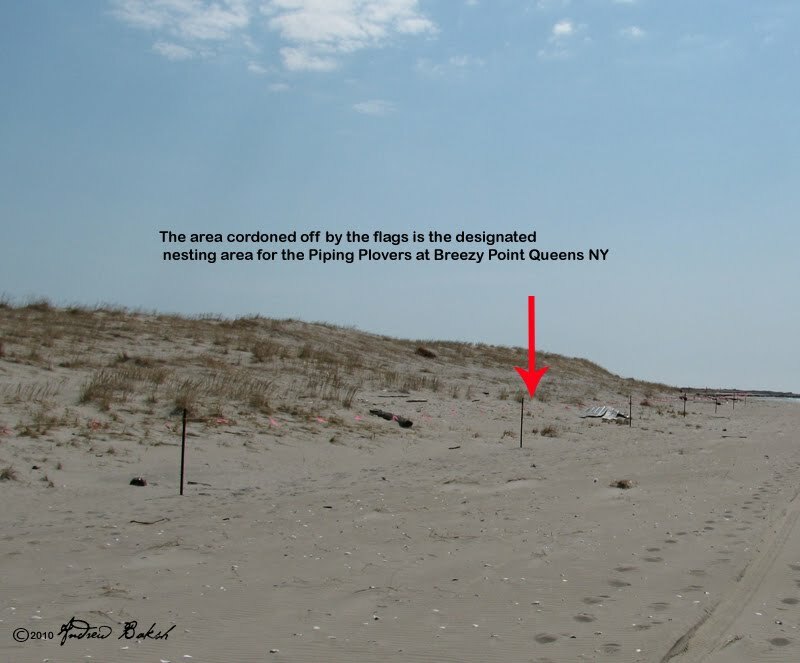 We were there to volunteer at the Piping Plover nesting site - a day where volunteers and rangers set out to demarcate the nesting area designated for Piping Plover, Terns and Skimmers. The task was a pretty simple one; all that was required was some dedicated time and willingness to walk the beach to string the markers and put up the nest signs. 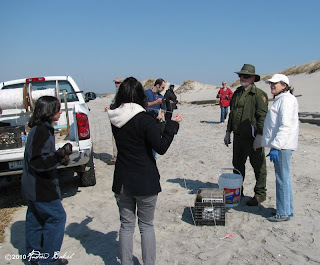 We had an enthusiastic group and in about 2 hours the nesting area was setup. Nesting area defined - now we wait for the nesting birds. Those volunteers who did not help with this assignment worked on debris removal from the beach. This was only one part of the volunteering. Some of us will be monitoring the nest sites once they are established. Last year, I participated in monitoring new born Plover chicks for the first few days and this year I will do the same, joining other volunteers, working in shifts to cover nest sites. Hopefully, we have good numbers to report later in the year. 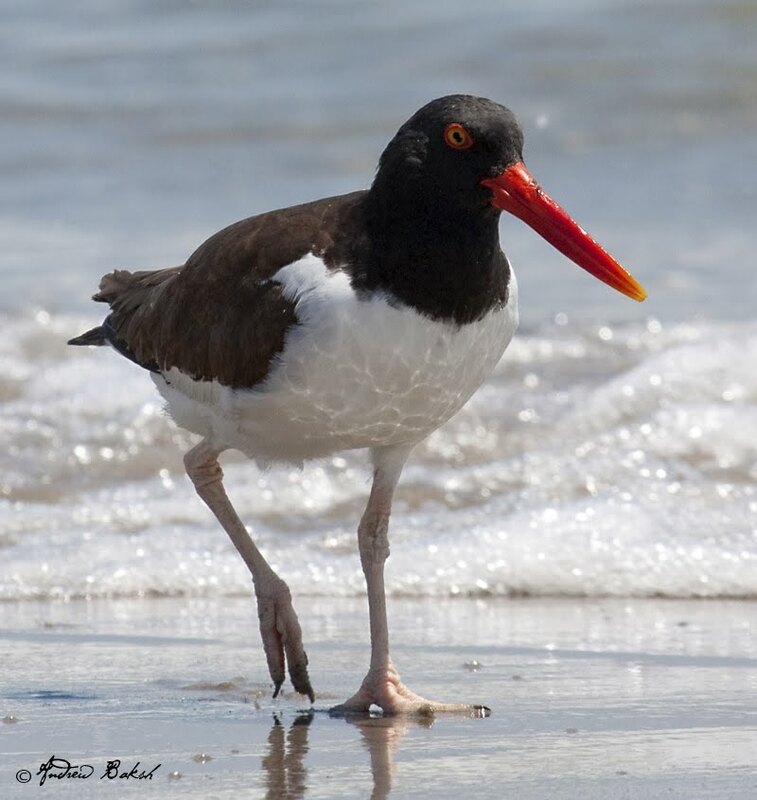 Oystercatchers share the beach with the Piping Plovers. 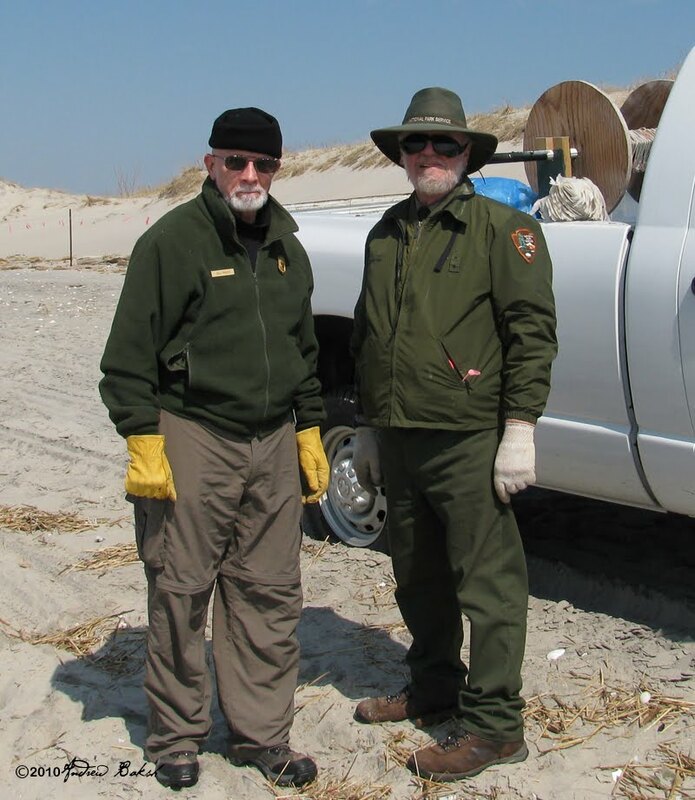 Tony and Bill from the National Park Service GNRA. 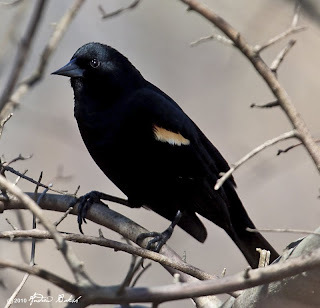 On Saturday, I headed out to join New York City Parks department official, Dave Kunstler, for a tour of a location in Van Cortlandt Park in the Bronx that is being considered for a birding program (yep…another project that I am involved with). Since, I was meeting Dave at 10:30 A.M. 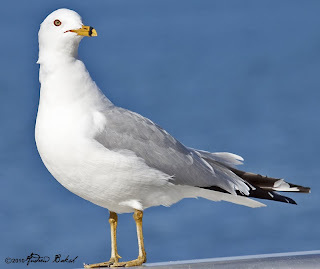 I decided to do some birding at Pelham Bay Park Bronx for a couple of hours. Pelham Bay, was relatively quiet with not much land birds except for flocks of Red-winged Blackbirds, Common Grackles and an increased presence of Brown-headed Cowbirds. 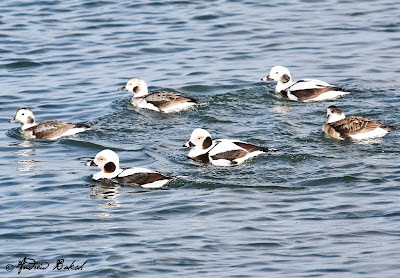 As it was low tide, there was not much waterfowl near the shore either, but I managed to pick up some Buffleheads out on the water. After a bit of poking around I left with 32 species for my day and site list. Heading over to Vancortlandt, I met Dave and started our walk/tour on schedule. Immediately on entering the park on the way to the Ranger station, I spotted a Swamp Sparrow and got Dave on it. Minutes later, I picked up my FOS (first of the season) Eastern Phoebe; I mused on the good start, as both birds were additions to my day list. Once into the park, Dave and I birded along the John Kieran Nature Trail that runs along the Van Cortlandt Lake. That trail led us near and across Tibbetts Brook which took us behind the golf course. 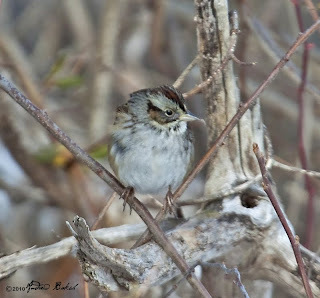 Here we had another Swamp Sparrow that was singing its heart out and we stopped to listen and take in the lovely song. On the bridge looking into an opening on the brook we spotted a couple of Green Winged Teals. 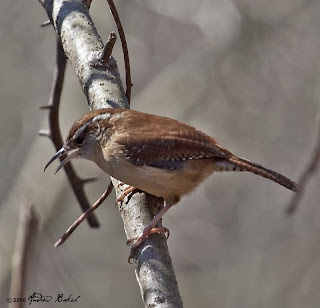 Around the same area, a couple of Carolina Wrens announced their presence first by voicing their displeasure probably at our presence, then singing as if acknowledging that we had passed inspection. From there, we took the path along the parade ground that took us to the path of Vault Hill. A little ways into one of our first hills, Dave pointed out a meadow, which was one of the few places in NYC where the Hoary Edge Butterfly can be found. Apparently, the meadow has a plant, Tick Trefoil that brings them in to that location. You could bet I will be checking that out when the time is right. I would love to see and photograph a Hoary Edge. We continued hiking the steep climb of Vault Hill and headed to the Northwest Forest. 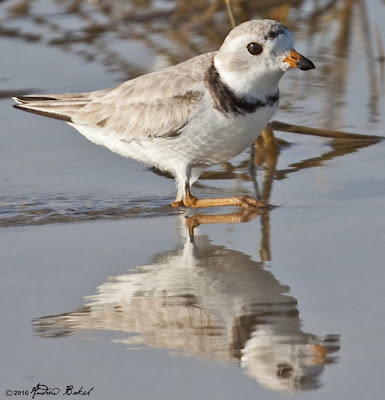 Here we saw many of the birds we had already seen and after a while Dave suggested that we headed back. Heading back, we came across the place or vault where many of the Van Cortlandts were buried until the land became a public park in 1888. After that time, the family purchased a large plot in the nearby Woodlawn Cemetery and the remains relocated. Around that same area, we both had our first Butterfly of the year, a Mourning Cloak. At the foot of the hill, we decided to cut across the parade field and found a lone Savannah Sparrow foraging on the ground. Across the field in an area that was undergoing some construction, I found 4 Killdeers and took the time to share scope views of these birds with some folks who were wondering what we were looking at. 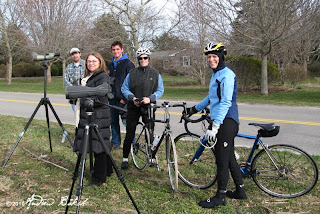 They were thrilled and were happy that we took the time out to explain to them the type of birds they had just seen; who knows, maybe they will become more interested in birds adding to the family of nature lovers out there. Dave and I, parted ways around 2:15 and I decided to head to Jones Beach. The traffic out of the Bronx was a crawl and I got to Jones Beach around 3:06 P.M. My first stop was the Coast Guard Station, where I quickly picked up Oystercatchers across the bay. 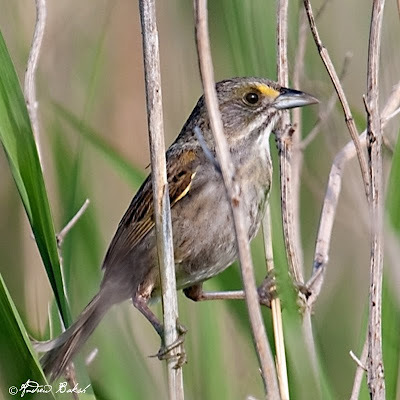 Around the station I had several Song Sparrows, White-throated Sparrows, Savannah Sparrows, 1 Immature White-crowned Sparrow and 1 Field Sparrow. 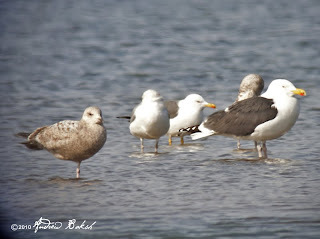 From there I birded around the Swale picking up a Lesser Black-backed Gull, Killdeers and Piping Plovers. On the way out, I picked up 3 Eastern Phoebes bringing my day total to 4 for that species. I had designs on making a stop at Alley Pond or Forest Park, but decided against it calling it a day after I encountered traffic on the Southern State Parkway. Not a bad day in the field; I picked up a few first of the year species and took the first step in exploring a potential bird program at Van Cortlandt Park in the Bronx. More to come on that I hope. 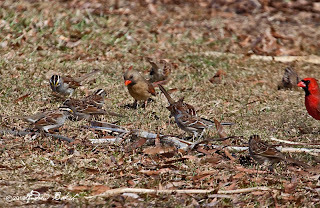 White-throated Sparrows, American Tree Sparrows and Cardinals forage. 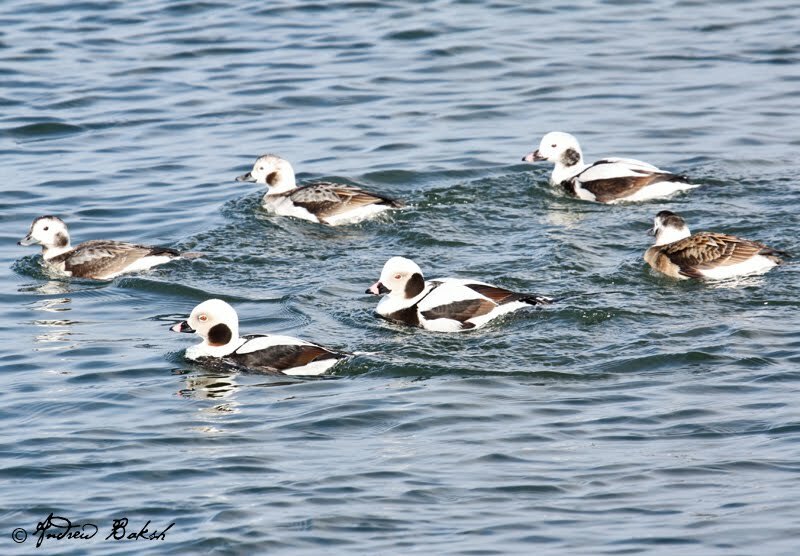 On Saturday March 6th, I headed out to Sunken Meadow Park in search of a Barnacle Goose that was reported earlier in the week. Unfortunately, I got on the road much too late than I would have liked, and hit the dreaded Southern State Parkway traffic, which cut into my arrival time. However, by 10:00 a.m. I was cruising into the park and browsing the flocks of Canada Geese. 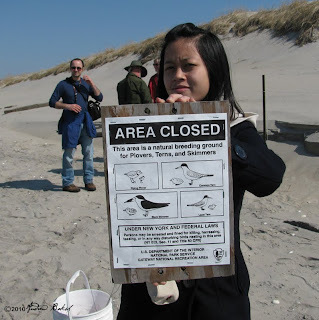 I could not find any presence of a Barnacle and ran into a few other birders who told me the place was dead. Now, I had planned on only spending about 1 hour at that location, but the comment on how dead the place was, well...don't laugh, but I decided to take this on as a bit of a challenge. Deciding that I would bird the park to see how "dead" it really was and to see what I could find. 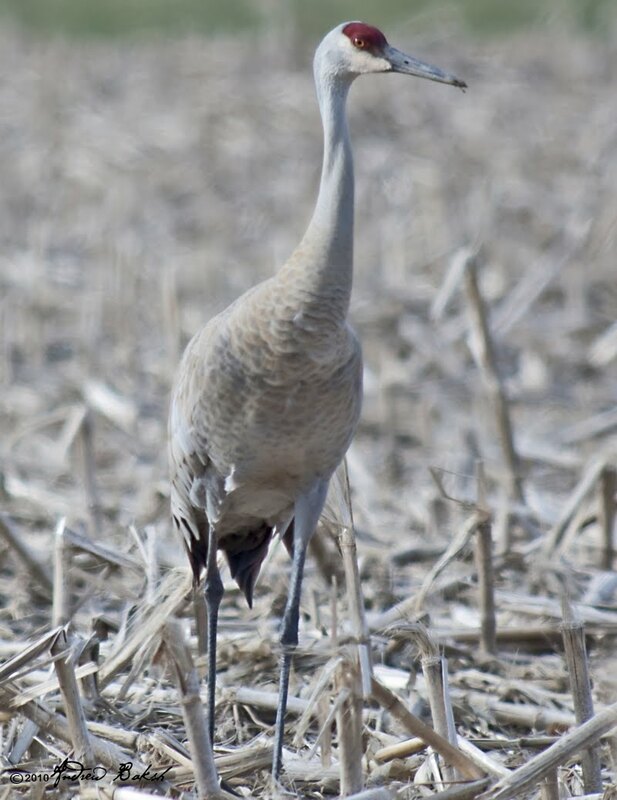 After working over the flocks of Canada’s, really closely for any possible Cackling Goose, I headed over to field 4 where I found a nice little flock of birds working the ground near a wet area. They turned out to be White-throated, American Tree and Song Sparrows with Cardinals in the mix. I patiently worked that area; at times, just pausing to listen, enjoying the sounds of nature. My patience was rewarded with the sounds of Red-bellied Woodpecker and an Eastern Towhee. 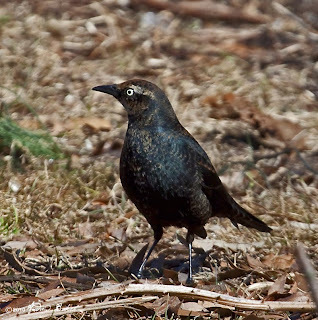 An hour well into birding that location I heard the chuck calls of a Rusty Blackbird, I counted about 3 present. As luck would have it, one of them landed right next to the spot where I was observing the flock of Sparrows and Cardinals earlier and I was able to get good looks. Next to the Merlin, that I found later on, this was arguably my best bird of the day. 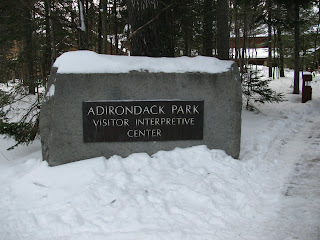 When I made the first of 2 north bound trips to the Adirondacks in upstate NY, back on February 15th, I learned about the unfortunate situation that the Visitor Interpretation Centers were facing. Apparently, when Governor, David Paterson unveiled his proposed 2010-2011 state budget on Jan. 18, it was revealed that the Adirondack Park Agency (APA) was planning on closing its Visitor Interpretive Centers at Newcomb and Paul Smiths at the end of 2010 to save money. The VICs were opened in 1980’s and 1990’s to introduce visitors, children and families to aspects of Adirondack Park wilderness and APA's role in land-use management. Both have extensive interpretive trail systems open free of charge year-round. The Paul Smith's VIC leases property owned by Paul Smith's College. The Newcomb VIC was built on property owned by SUNY College of Environmental Science and Forestry, which is state insured. The Town of Newcomb has expressed interest in helping operate that VIC. However, the future of eight full-time and two part-time state jobs at the VICs remain uncertain. As well as, many of the folks that volunteer at the VICs. Andy Flynn, a local publisher and former senior communications specialist for the Paul Smiths VIC, who has taken a leadership role in the fight to keep the VICs open, wrote an excellent article in the Adirondack Daily Enterprise. I hope you will take the time out to read his article and voice your support. We must keep the VICs open. Back on February 13th, I had visited Jamaica Bay my usual haunt to scout the area for a scheduled walk I was going to co-lead that weekend. 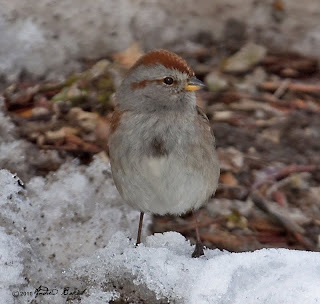 The ponds were pretty much iced over, but I managed to pick up some land birds; I ended up with a 5 sparrow day, that included Fox, Song, White-throated, American Tree and Swamp Sparrows. 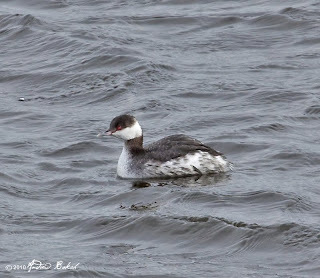 Later at Canarsie Pier in Brooklyn, I had a good time observing a number of waterfowl close in especially Horned Grebes. Here are some of my photos of that day.